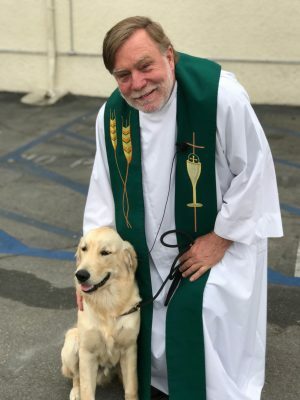 As I am being welcomed into St. Raphael’s Church and School Community as the new priest, I welcome you to this loving oasis in the midst of the bustling City of Los Angeles. Angels in the scriptures are ‘messengers’ from God to do a particular mission. Raphael, which means “God heals”, is an archangel for the Jews, the Muslims and for us who follow Jesus! What a gift for our community to be named after, and share in the mission of Raphael: “God’s healing”! As we create messengers of healing in our parish school, I am committed to supporting Mrs. Hurtt, our teachers, staff and you in empowering your/our young Christian leaders in a loving and safe environment. My hope and prayer are that what we do in this sacred space is poured out into your homes and neighborhoods as a sacred and healing dwelling for others. St. Raphael’s Parish was established in 1925. Reverend William Mullane was appointed the first Pastor of St. Raphael by Bishop John Cantwell. Within the first year of the parish history, Father Nillane built the Tudor/Gothic-style church that stands today. The Swedish Hall (Mayflower Auditorium) was used for dinners, dances and all other social activities within the parish. The Carmelite Fathers arrived in the year 1934. In June 1946, plans were drawn up for the construction of the current grammar school, cafeteria and auditorium. The entire plant was built of reinforced concrete and was entirely fireproof. At that time, the capable and competent aid of the Adrian Dominican Nuns was secured. The Mount Carmel Center, which was made possible through a generous grant from the John and Dorothy Shea Foundation, was opened in 2005. Father Tracy O’Sullivan, O.Carm., provided spiritual leadership and guidance to St. Raphael Parish from 1995 – 2014. On November 17, 2014, Father Michael Joseph Wu was named Pastor of St. Raphael Parish, succeeding Fr. Tracy O’Sullivan.